This web article from NASA's Visible Earth presents a classic photograph of Earth taken from the Apolo 17 mission in 1972, which includes the south polar ice cap. The article contains several downloadable images, and links are provided for more information. This resource was a Physics To Go feature from June 1, 2009 until June 16, 2009. View the feature here! Does not have a copyright, license, or other use restriction. (Goddard Space Flight Center, Greenbelt, 2009), WWW Document, (http://visibleearth.nasa.gov/view.php?id=55418). The Blue Marble from Apollo 17, (Goddard Space Flight Center, Greenbelt, 2009), <http://visibleearth.nasa.gov/view.php?id=55418>. Goddard Space Flight Center. 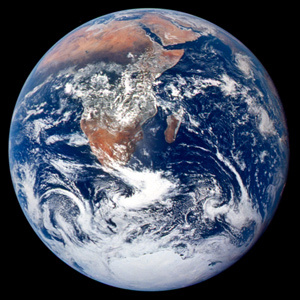 The Blue Marble from Apollo 17. Greenbelt: Goddard Space Flight Center, June 8, 2006. http://visibleearth.nasa.gov/view.php?id=55418 (accessed 19 April 2019). The Blue Marble from Apollo 17. Greenbelt: Goddard Space Flight Center, 2009. 8 June 2006. 19 Apr. 2019 <http://visibleearth.nasa.gov/view.php?id=55418>. Have experience with this material? Login to leave a comment sharing your experience. Know of a related resource? Login to relate this resource to other material across the web. Know of a better resource? Suggest it! See a problem with this material's physics or description? Contact us!